This extraordinary journey discovers the rich cultural heritage of this diverse country and its peoples, beginning in the city of Yangon, formerly Rangoon, with its glorious array of architectural wonders including the famous Shwedagon Pagoda. Known today as Suvanabhomi, the Golden Land, Burma is a land of beauty and inspiration and the Burmese are a gentle and serene people with a deep-rooted belief in Buddhism and spirit worship, which is reflected in the thousands of beautiful pagodas in ancient Bagan and the monasteries of Mandalay, highlights of our trip. The tour finishes at the beautiful Inle Lake, famous for its floating villages and gardens and the leg-rowers of the Intha tribe. Upon arrival, you will be greeted by your guide who will accompany you as you transfer to the hotel. Yangon, formerly known as Rangoon, is a relatively quiet and charming city. Its impressive colonial and spiritual`l heritage makes it one of the most fascinating cities in Southeast Asia. After lunch your guided tour goes to Kandawgyi Park, one of central Yangon’s greenest spots. Here you will see the glittering Karaweik barge, a replica of the royal barge, and the vast lake with views of Shwedagon in the background. Depending on the day of your visit Kandawgyi may be busy with local families who come here on the weekend to relax in the fresh air. After breakfast, we’ll visit Kyaukhtatgyi Pagoda, home to a 70-meter long reclining Buddha. A visit to Kyaukhtatgyi provides a great overview of Buddhism with murals depicting the life of Buddha, the feet of the statue carved with traditional symbols and often many locals gathering to pay homage and pray. After that proceed to Kalaywa Monastry ,which is home to one thousand monks. In his lifetime a Burmese male is expected to spend some of his life serving as a Monk to learn the ways of Buddhism. We will be able to observe the late morning procession to collect alms and learn about the monks’ way of life. Afterwards, return to the hotel for an afternoon at leisure. After breakfast transfer to the airport for your flight from Yangon to Mandalay. Leave Mandalay for a scenic two-hour drive to the former British hill station of Pyin Oo Lwin (also known as Maymyo) located on a plateau 1,000m above sea level. Many reminders of the colonial era are still present in Pyin Oo Lwin, including brick and timber houses. Pyin Oo Lwin is home for many ethnic tribes as well as a considerable numbers of Nepalese and Hindu who migrated during the British occupation, famous for its climate weather. Enjoy a traditional horse cart and carriage ride through town. Stop at the Botanical Gardens, 432 acres of leafy gardens home to a diverse mix of botanical species from around the world. The Gardens were established by Sir Harcourt Butler, former Governor of Burma. Continue to the local market to see the multicolor flowers and vegetables on sale. After breakfast at hotel, drive back to Mandalay. Upon arrival to Mandalay, you’ll visit the Mingun Bell which weighs more than 87 tons and is more than 3.7 metres tall. This is the world’s largest uncracked bell. Just south of the bell you’ll also visit Mingun Pagoda, a giant brick structure built in the late 1700s and although it was unfinished due to economic troubles it is still an impressive site. Mingun’s other highlight is the Hisnbyume Pagoda, a white-washed temple built to resemble Mount Meru. Throughout Mingun there are small neighborhoods crafting traditional basketry and other artistic items and there is plenty of time to stop and interact with the craftsmen and friendly locals. On the return boat journey an early lunch will be served. After that , transfer to your hotel for check in. In the evening, enjoy your dinner at A Littile Bit of Mandalay. After breakfast transfer to the Mandalay’s Jade Market. Wet, wild and wonderful, the market is an experience that brings history, culture and modern Myanmar to life. Rarely visited by tourist, making it one of the few markets in Southeast Asia where an authentic experience can still be found. The traders are here to conduct serious business and pay little attention to camera-toting foreigners. Myanmar’s jade trade dates back thousands of years. Then continue south of the city to Ava, the capital from 14th to 18th centuries, where a short ferry ride will take us across the river to where our horse and carriage are waiting. Visit the old wooden Bagaya Monastery and the remains of the Royal Palace and Fort. There are many small villages located amid Ava’s ruins and as you travel by horse and cart you’ll get a glimpse of local life in the Burmese countryside. We’ll stop for lunch at local restaurant in Ava before returning to our car. Return toward the city and stop at Amarapura, a former capital whose name means ‘City of Immortality’. First visit a silk weaving workshop. After touring this tranquil site, continue to U Bein Bridge for a walk along this 200 year-old teak bridge. The bridge was constructed of 984 teak posts that were once part of the deserted Inwa Palace and it is 1.2 kilometers in length making it the world’s longest teak span. Enjoy a stroll along the bridge and the fabulous views of the surrounding farms and streams. Dinner at Tom Yam Keong. This morning, embark on a boat trip up the Irrawaddy River from Mandalay to the riverside village of Mingun, enjoying the picturesque scenery of this river and the lifestyles of the local people who live and work on these waters. Unlike Ava and Amarapura, Mingun was not a royal capital yet has many interesting sites to see. You’ll visit the Mingun Bell which weighs more than 87 tons and is more than 3.7 metres tall. This is the world’s largest uncracked bell. Just south of the bell you’ll also visit Mingun Pagoda, a giant brick structure built in the late 1700s and although it was unfinished due to economic troubles it is still an impressive site. Mingun’s other highlight is the Hsinbyume Pagoda, a white-washed temple built to resemble Mount Meru. Throughout Mingun there are small neighborhoods crafting traditional basketry and other artistic items and there is plenty of time to stop and interact with the craftsmen and friendly locals. Have a lunch on board. From the jetty transfer back to your hotel. The rest of day is at leisure in Mandalay. Early Morning, transfer to Mandalay airport flight to Bagan. Upon arrival to Bagan, transfer directly to your hotel for check in. (early check-in subject to availability). After check in, your journey begins with a visit an elevated temple from where you will have a panoramic view of the magnificent plains of Bagan. 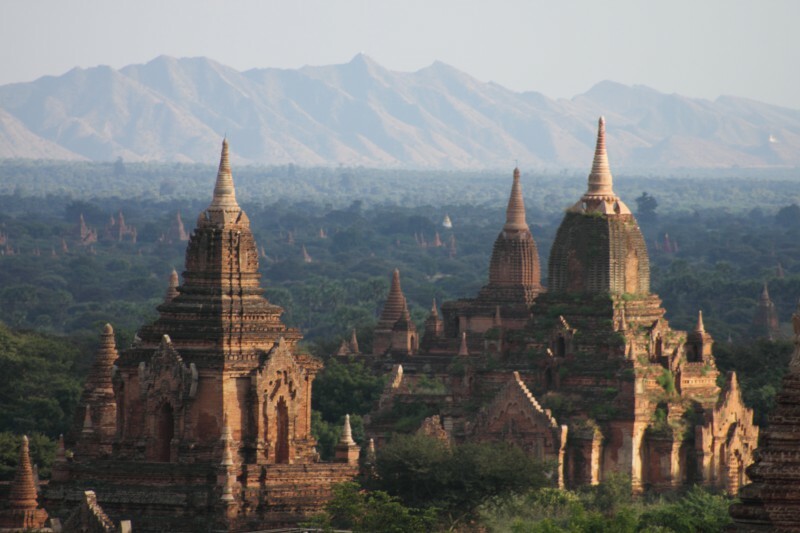 Continue with a visit to the golden stupa of Shwezigon Pagoda for an introduction in to Bagan’s rich history. Then, visit to nearby Wetkyi-In Gubyaukgyi, a cave temple with exquisite jataka mural paintings and the elegant Htilominlo Temple noted for its fine plaster carvings and glazed sandstone decorations. After lunch, continue to the rural village of Minnanthu, one of Bagan’s least visited areas. Here you will explore temples such as Payathonzu, Lemyentha and Nandamannya before heading to the riverside pier. Afterwards head to Red Mountain Winery for a tasting of locally produced reds and whites. From the middle of the lake, continue down a small canal leading to the Pa-oh village of In Dein. Explore the area on foot, strolling around the village and wander through the beautiful Alaung Sitthou area. Alaung Sitthou is filled with picturesque ancient stupas and has magnificent views of the lake below. Afterwards take an afternoon walk through one of Inle’s lakeside villages. After breakfast, transfer to Heho airport for your onward flight to Yangon. Upon arrival, head to your hotel to drop off your bags (early check-in subject to availability). After check in, the 3 hour walking tour will cover 4-5 kilometres in the central districts of downtown. Many of the buildings visited are on the Yangon City Heritage List, a list of 188 man-made structures mainly consisting of religious landmarks and colonial-era buildings. Highlights include City Hall, the old railway station and the former Minister’s office where General Aung San was assassinated. Interspersed in the guided walk are various religious sites such as the St Mary’s Cathedral, built in 1899, and the Buddhist landmarks of Sule Paya and Botataung Pagoda. By walking through the streets you’ll also have a chance to witness the lifestyles of the locals- from the busy bus and boat stations to the tea shops and hidden street markets. There are plenty of chances to interact with Yangon residents and learn more about the Burmese culture. After lunch, visit to Bogyoke Market, formerly known as Scott’s Market, where there is time to browse through the dozens of stalls and shops. This is Yangon’s best market for handicrafts and other goods. In the late afternoon, transfer back to your hotel and take a short rest. Farewell dinner at Le Planteur.